This clean faced fireplace doesn't need a large space to create a distinct feature in your home. 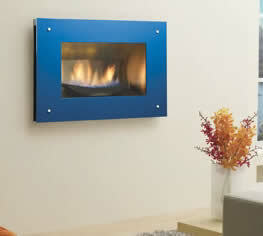 The shallow (12-3/4" deep) direct vent firebox allows your customers to install a contemporary fireplace anywhere! The chic, slim line fascia is available in understated black, stainless or vibrant colors guaranteed to demand attention. This compact fireplace delivers beautiful zone heating so that you can turn your furnace down and enjoy heat in the rooms you spend time in.